It's Wednesday, New Year's Eve, and time for a new challenge at Inspiration Destination Challenge Blog. Again this week, the challenge is 'Anything Goes'. One of our sponsors this week is The Cutting Cafe, a company I am on the design team for, so I had lots of files to choose from. 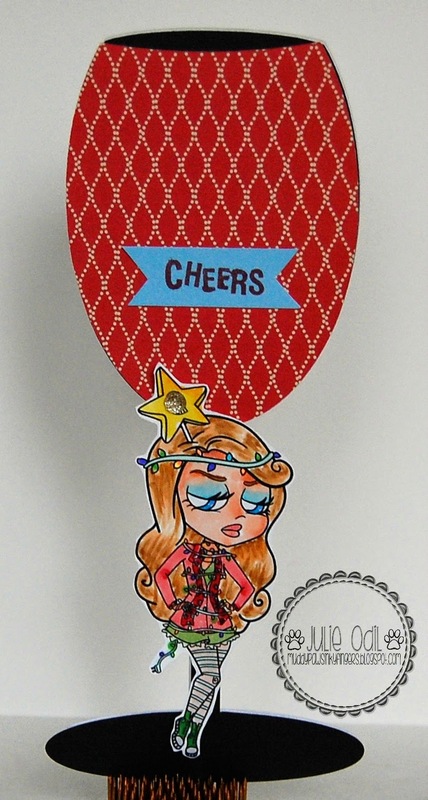 Since it's New Year's Eve, I thought a Wine Glass shaped card would be perfect! The image is a freebie I got for participating in the progressive challenge at The Outlawz. The image is from Simply B Stamps, and I colored her with Copic markers. The papers, sentiment stamp, and bling are from Close To My Heart. 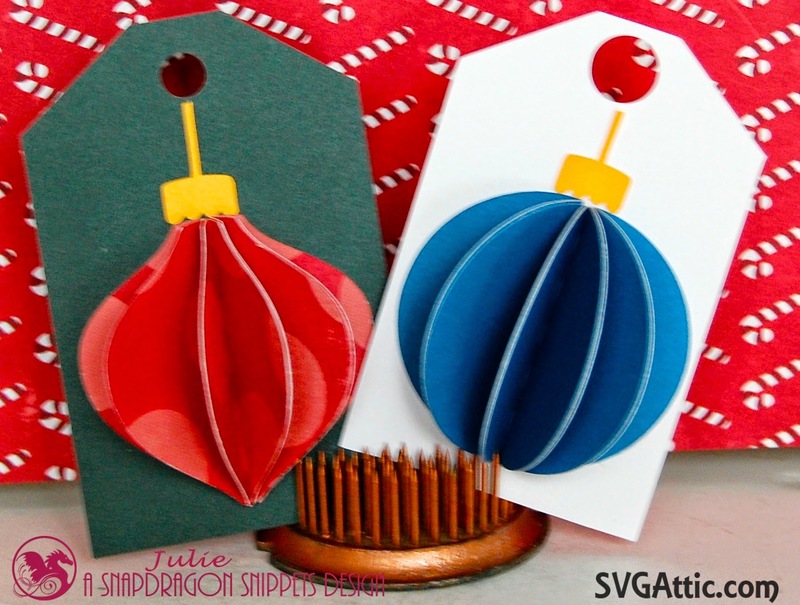 Don't forget to link up those projects this week at Inspiration Destination Challenge Blog! I'm guest designing today at Pause, Dream, Enjoy Linky Party, and I couldn't be more excited! Thank you, Janis, for the invitation! The new theme for the linky party starting today is "Celebration". Since my brother's birthday is in a few days, this was a great theme for me! All the supplies for this card are from Close To My Heart. This stamp set has become a new favorite, using it for birthday, sympathy, and everyday cards. 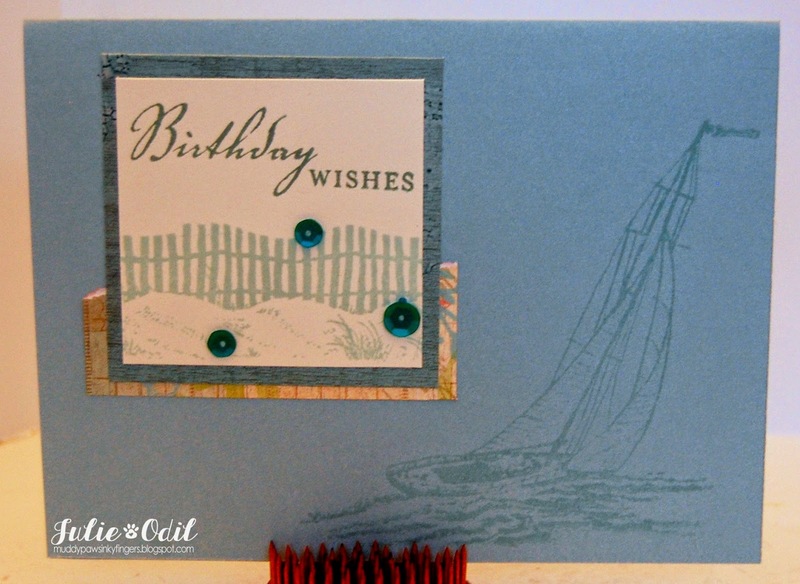 This card was for my brother, and he loves to sail. He'll love the boat! I kept the card flat for mailing and didn't add too many layers to keep the feel more masculine. Which do you like better? You'll have to let me know in your comments. Thanks for visiting, and please link up your celebration projects at Pause, Dream, Enjoy Linky Party. Again, thanks to Janis and the design team for this opportunity to guest design. It's Monday, the last one of 2014, and time for a new challenge at Eureka Stamps. This week, our theme is "Something Old, Something New". I used some old things from my stash and a new technique. 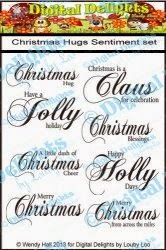 I used 2 digis from Eureka Stamps -- Candy Cane (digi10702) and a Christmas Thank You (digi12601). 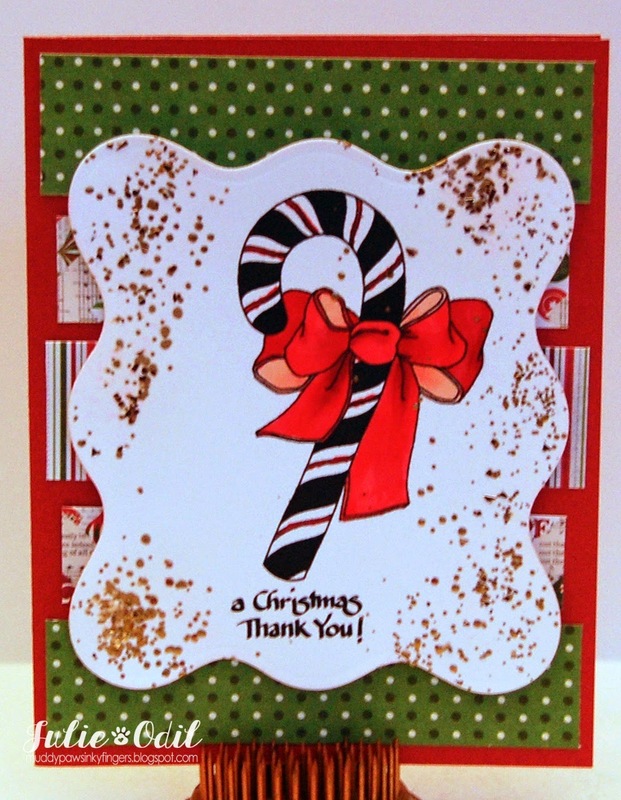 The candy cane and ribbon are colored with Copic markers, then cut out with a Spellbinder die (one of the old things for this challenge). The designer papers are Echo Park Reflections Christmas (used scraps). The card base is Ruby card stock from Close To My Heart. The new technique is the Frantage glitter from Stampendous. Did you get some new scrapping supplies &/or tools for Christmas? Break them out and join our "Something old, Something new" challenge this week at Eureka Stamps. FUN! It's Friday, the day after Christmas, and time for a new challenge at QKR Stampede. Our theme this week is Santa or snowmen. Since QKR Stampede has some of the cutest snowmen ever, that's the theme I went with! This QKR Stampede digi is called "Selling Snowflakes" (digi14214), colored with Copic markers. I just love this snowman! We've had snow on the ground since early November, but most of it melted before Christmas. I actually may buy some of these fellas snowflakes! 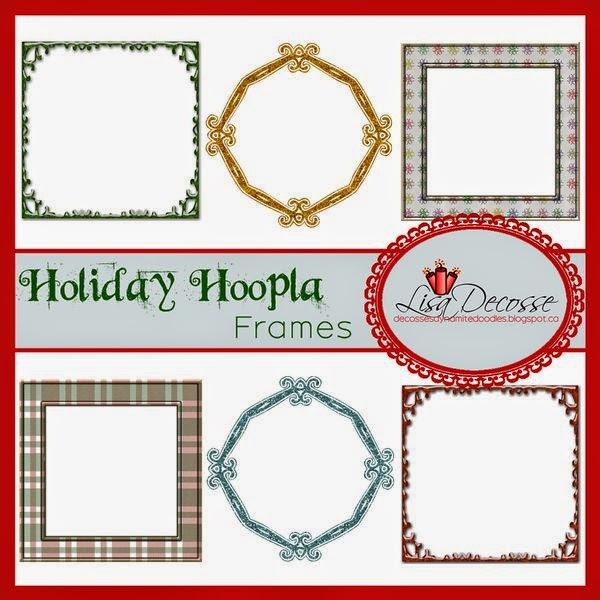 Papers are from My Mind's Eye 12 Days of Christmas 6x6. 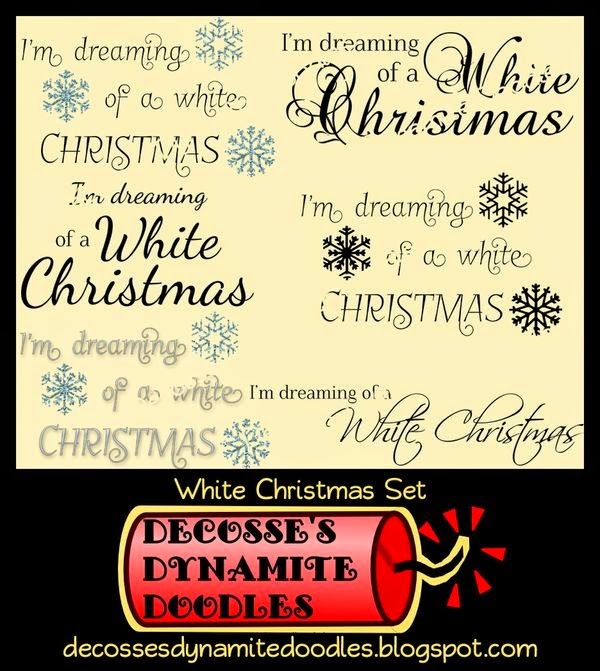 The snowflakes are a Cheery Lynn Snow Flower die set. The snowman was cut out with a Spellbinder label die, then some Stickles glitter glue was added to his hat, the holly, and the snowflakes. Card stock is from Close To My Heart. I hope you had a great Christmas and find some time to join in on our Santa or Snowman challenge this week at QKR Stampede. It's Friday, the day after Christmas, and I'm playing along with Unity's Friends with Flair. I needed 10 thank you cards, and I needed them quick. I came up with a simple design that I could replicate easily. The stamp set is "Like a Snowflake" (December, 2014 Sentiment Kit). The label is cut out on my Cricut, using the Art Philosophy cartridge from Close To My Heart. The card stock and rhinestone bling are also from CTMH. I hope everyone had a great Christmas! This was the first one without my father, so there were some moments that were difficult, but there were some very lovely, tender moments also. Happy New Year to all my Unity Peeps! It's Friday, and I'm lucky enough to be able to post today for 3 Girl JAM. I love my day to post on their blog! I hope everyone had a nice Christmas. If you are like me, now it's time to get going on those Christmas thank you cards. 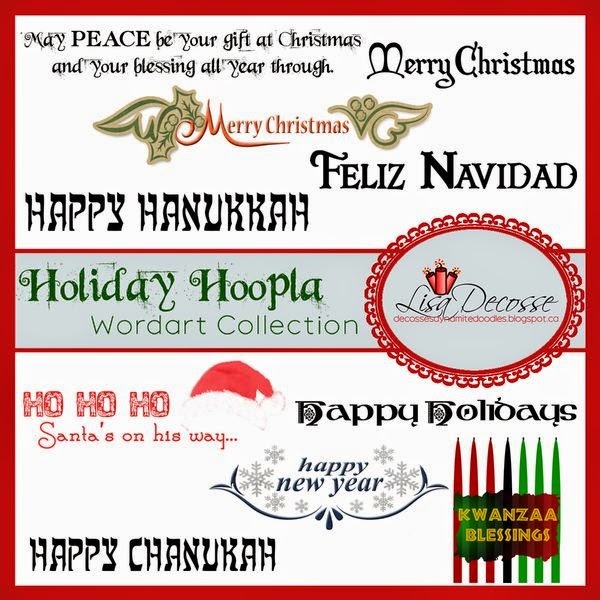 I found this card design in the Silhouette Design Store, by Lori Whitlock. The crinkle ribbon (3 Girl JAM -- goes without mentioning, I know), is the Holly Berry ribbon from the Winter Bundle. The card stock is from Echo Park. The red brad is from Close To My Heart. That's it! If you'd like some fantastic 3 Girl JAM products for yourself -- perhaps a little after Christmas splurge -- use discount code JO10 for 10% off your entire order! Our "thankful" challenge is still going on for another week on the 3 Girl JAM Challenge blog. Make those thank you cards, add some ribbon and link them up! It's Christmas Eve, and if you're still wrapping gifts you may need a quick, but cute gift tag idea to finish the wrapping in a snap! I'm posting today for Snapdragon Snippets. They have lots of tag ideas, but these appealed to me because I could make a few quickly. Each would be unique, but the process would be the same. Most paper is from Close To My Heart. There is a little Echo Park Dots and Stripes, too. I left them without ribbons or twine until I adhere them to packages or bags so I can match colors then. These 3D tags are available in the Snapdragon Snippets Store. I wish you and your a meaningful and blessed Christmas season! 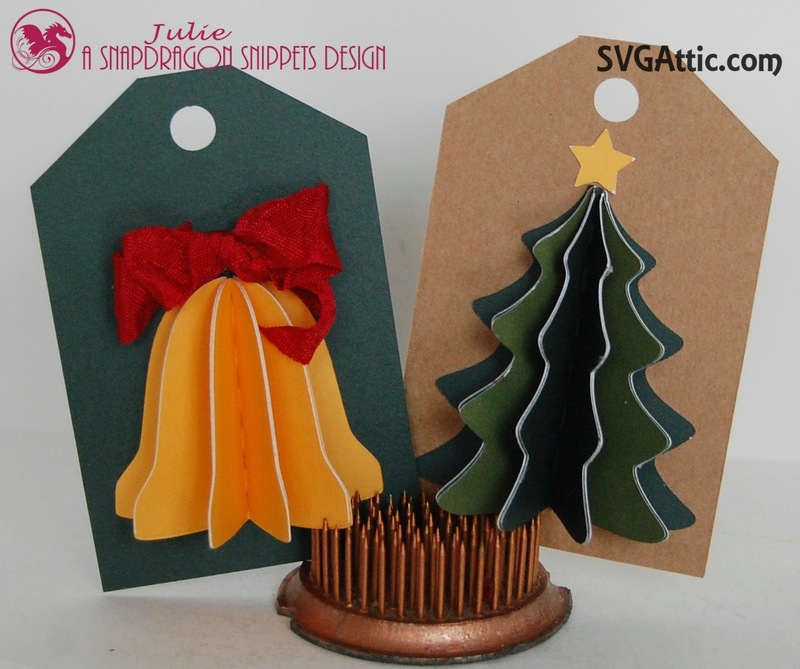 It's Wednesday, Christmas Eve, and time for a new challenge at DigiStamps4Joy. Today, we start an "Add Glitter" challenge. This will be a 3-week challenge, going until January 13, giving the team a bit of a holiday. 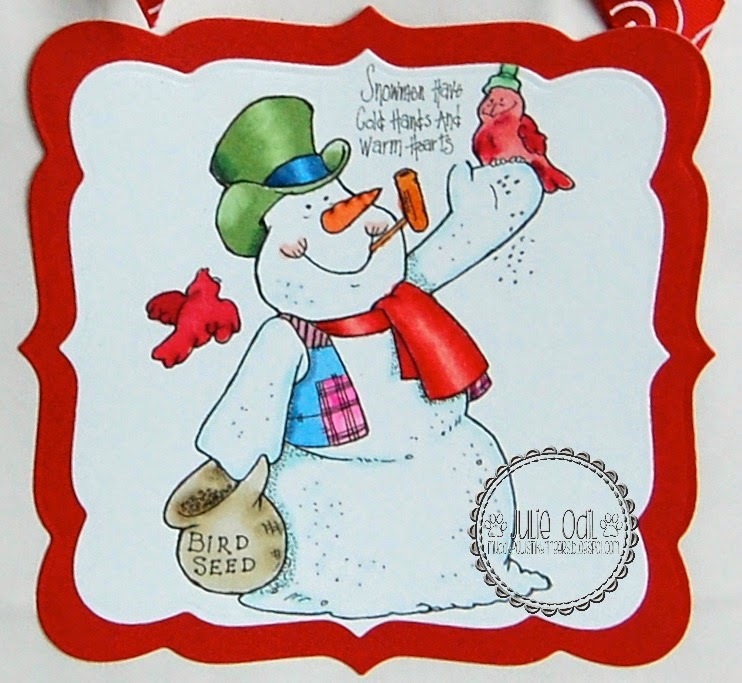 I used the DigiStamps4Joy digi stamp, Mr. Snowman on this card. 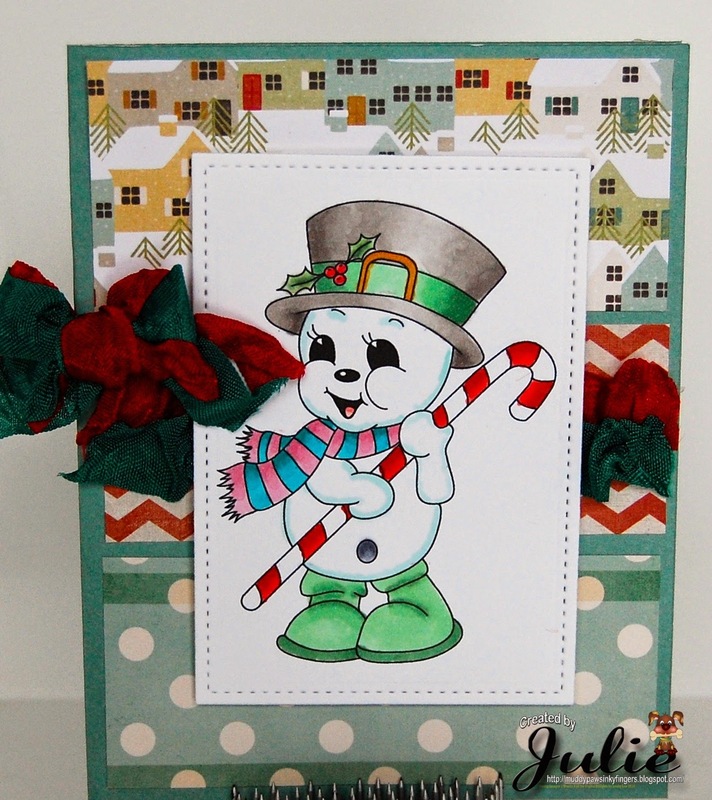 I colored the image with Copic markers, then used some Frantage by Stampendous around the edges of the snowman and on the diecut deer. The deer is cut out of chipboard with a Sweet Cuts die. The "joy" sentiment is a Lawn Fawn die. There's also a Spellbinders die used to cut out the shape behind the snowman. I added touches of glitter using some Stickles glitter glue on the snowman's scarf and hat, and the bird's wings. The gold glitter trim is from Close To My Heart. Designer papers are by My Mind's Eye Winter Wonderland 6x6. I hope you join us for our Glitter Challenge. Merry Christmas! I hope it's full of magical moments! O Holy Night -- for Amy Doodle's Stamp Co. 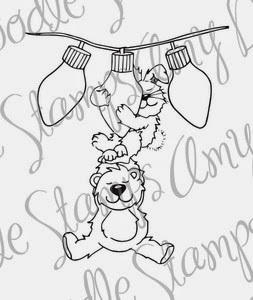 I'm posting today for Amy Doodle Stamp Co. It's Tuesday, and VERY close to Christmas. I'll keep this short, and I know everyone is super busy! This digi is called "The Nativity". 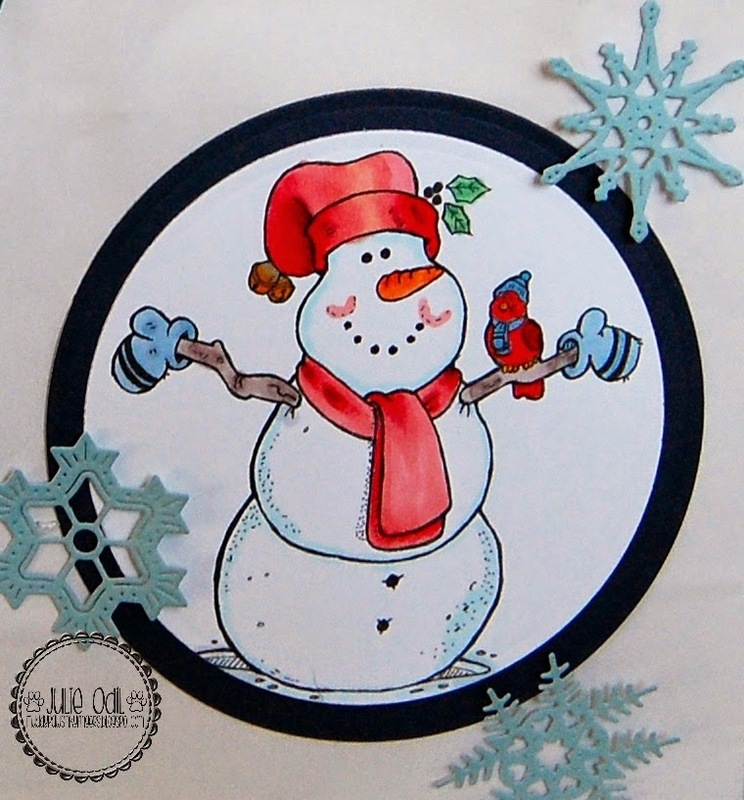 I colored it with Copic markers, cut it out with 2 sizes of Spellbinders ornament dies, backed with Close to My Heart Snowhaven Paper. The ribbon is from Really Reasonable Ribbon. I wish everyone a meaningful and blessed Christmas. It's Monday, and although we're very close to Christmas, I have a card to share that actually ISN'T a Christmas card. And, to be honest, it was a welcome break to make something other than one. 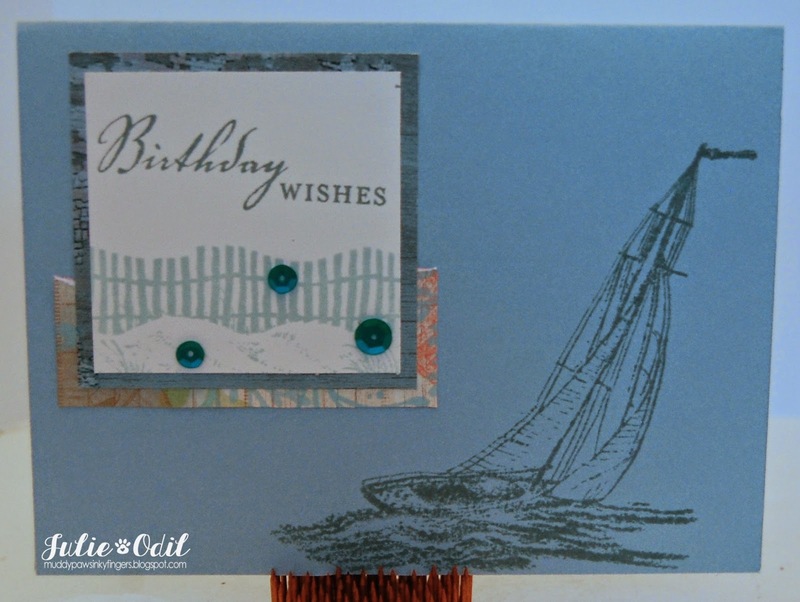 This card, for My Whimsical Little World, features one of the digis stamps, Warm Wishes, being released today. I printed the digi on American Crafts Jack Frost 6x6 Papers, fussy cut it, and mounted it with 3D foam tape onto Outdoor Denim card stock from Close To My Heart. The sentiment is from Simon Says Stamp. I used a white Sharpie to draw in the steam from the the beverage. 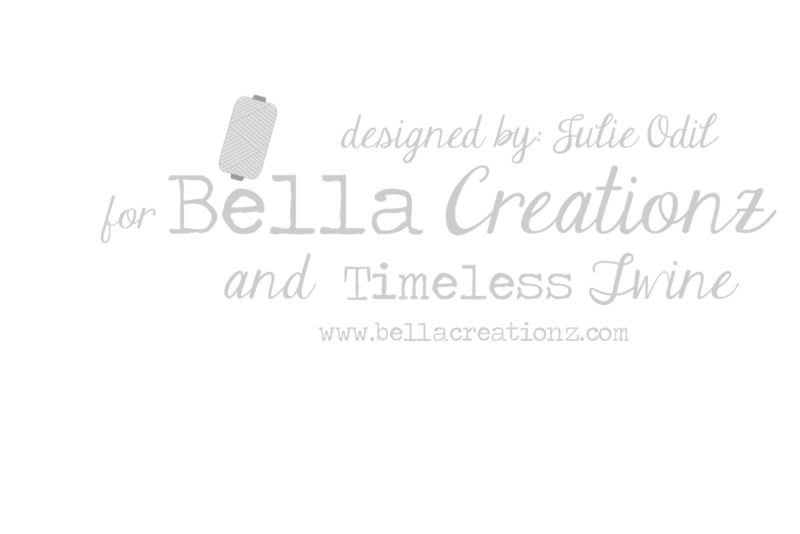 The sequins are from Bella Creationz/Timeless Twine. I hope you like my CAS card! There's more inspiration and other new releases featured today on the My Whimsical Little World blog, so please stop by there for a visit. There's always fun and inspiration on the MWLW Facebook page, too! It's Monday, and Christmas is oh-so-close! You can see it from here! 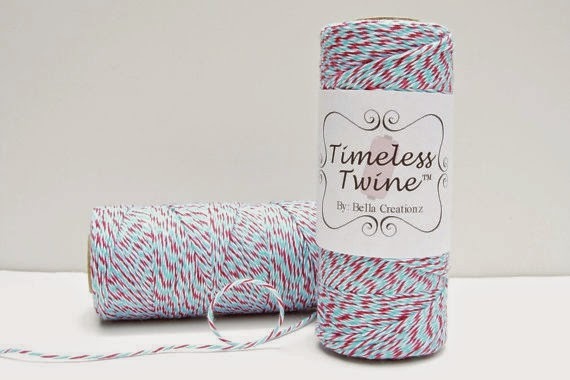 I'm posting today for Timeless Twine, where, for the last week, we've been featuring projects with Firecracker Twine. We needed a small Christmas tree in our house, since our dog, Sophie, steals ornaments off of anything she can reach. I was busy tying bows on this tree! And, it is, of course, Timeless Twine from top to bottom, in Firecracker (Aqua Blue and Red). 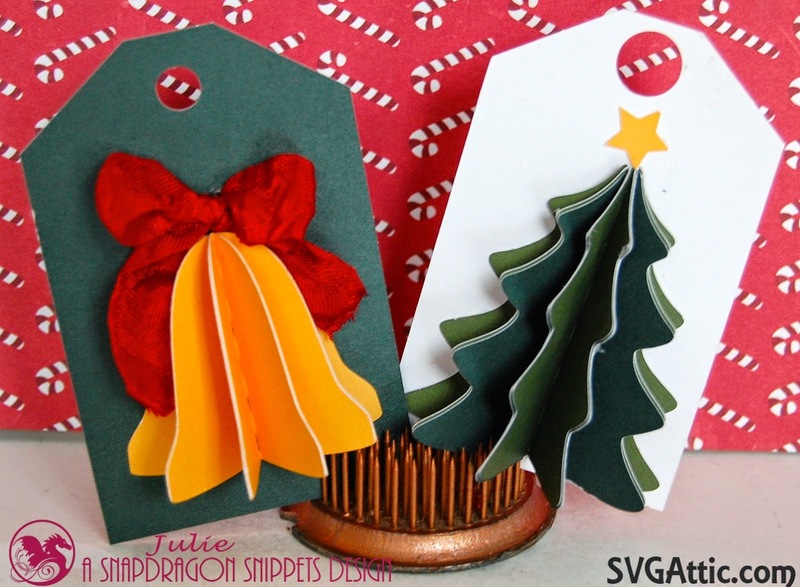 The 3D Christmas tree is an SVG cutting file from Snapdragon Snippets. All card stock is from Close To My Heart. Christmas tree up and decorated? Check! Have a wonderful, meaningful Christmas season, everyone! It's Monday, and time for a new challenge at Eureka Stamps. This week, our theme is "Use glitter". UGH! If you know me at all, you know I stay away from the stuff at all costs. Glitter and I do NOT mix! This challenge was just that -- a challenge. However, with some new products I wanted to try out, I managed to make a mess (of course), get glitter everywhere (I always do), AND have fun. I guess that's what this hobby is all about! 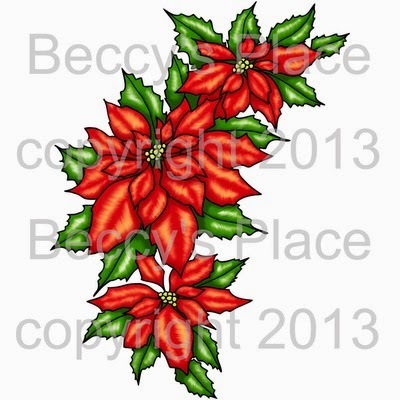 I used the Eureka Stamps digi, Poinsettia (digi16501) and colored it with Copic markers. Then, the glittering began. I added several shades of Stickles glitter glue to the Poinsettia itself. I used gold Frantage by Stampendous around the edges of the diecut, then mounted it on American Crafts glitter paper. The designer paper is by Echo Park. 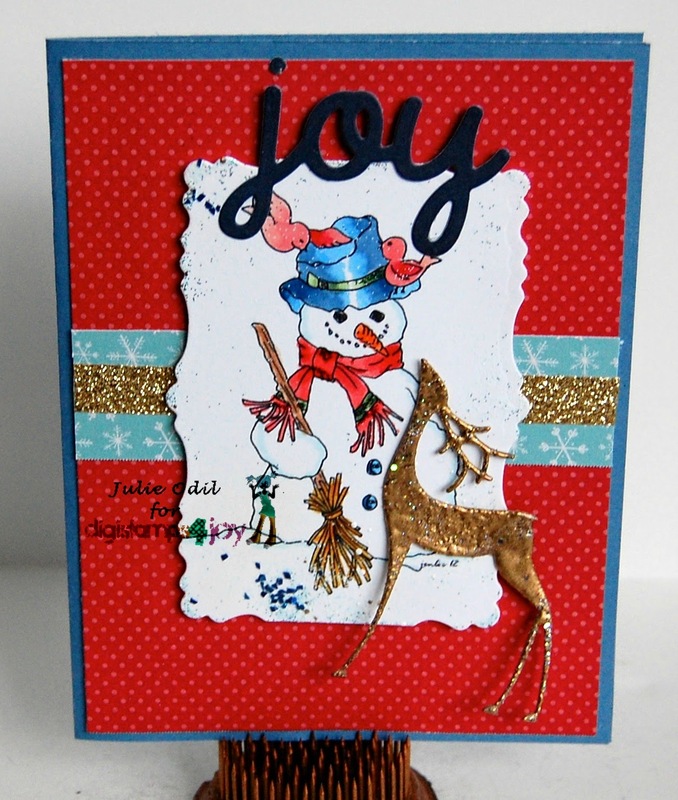 The "joy" sentiment is a diecut from Lawn Fawn. The crinkle ribbon is from 3 Girl JAM. It is from the Ribbon Candy Bundle. 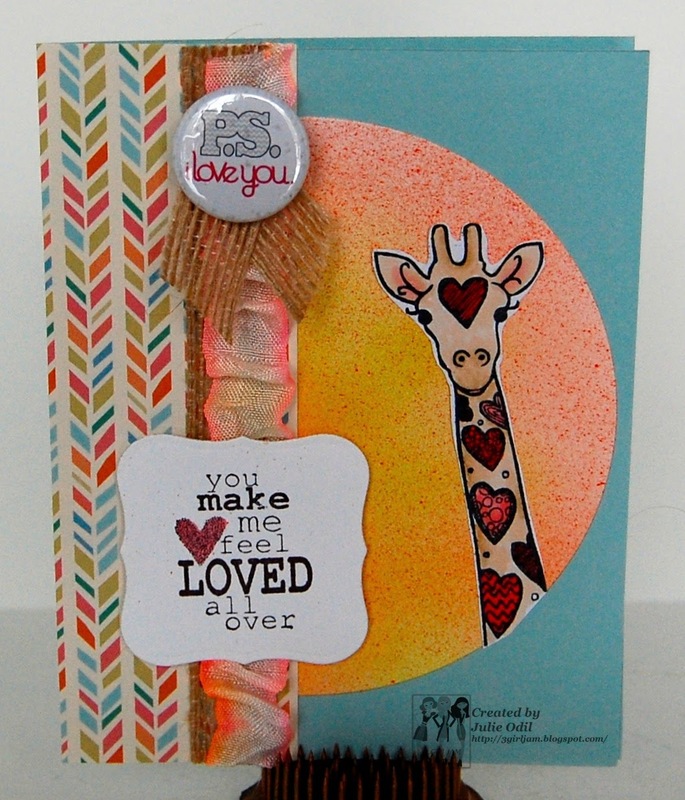 The cardstock base is from Close To My Heart. 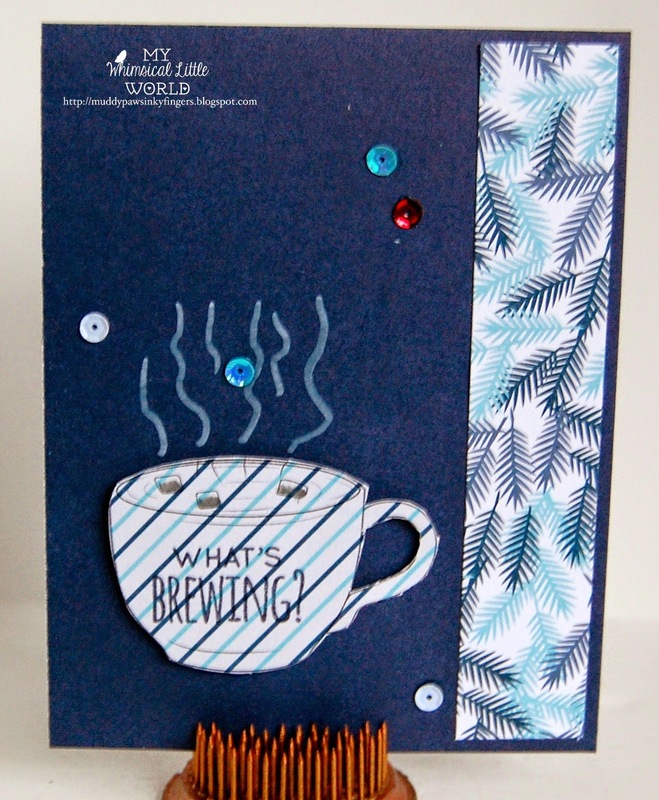 I had my glitter challenge -- I hope you join us this week at Eureka Stamps and glitter up your own project. I'd love to see what you make! It's Sunday, and Christmas creeps ever closer! 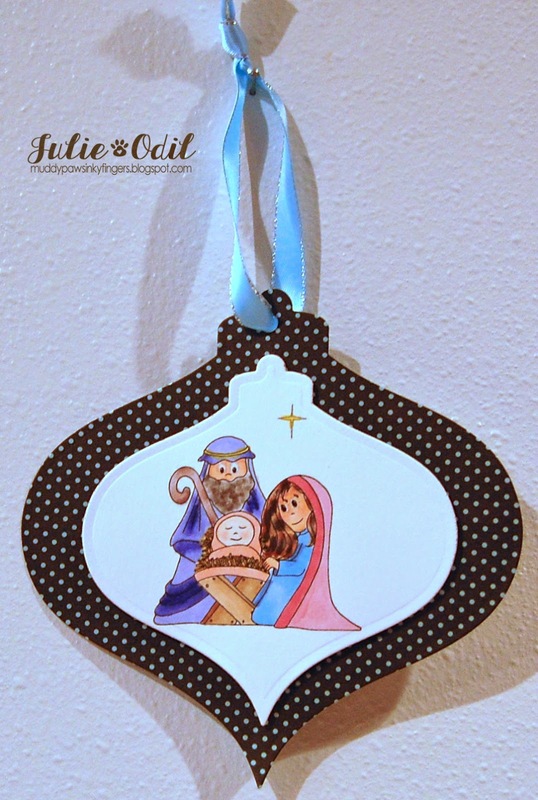 I'm posting today to promote a new blog that is about to launch -- the 12 Months of Christmas Link Up. This is my first official post for the blog. 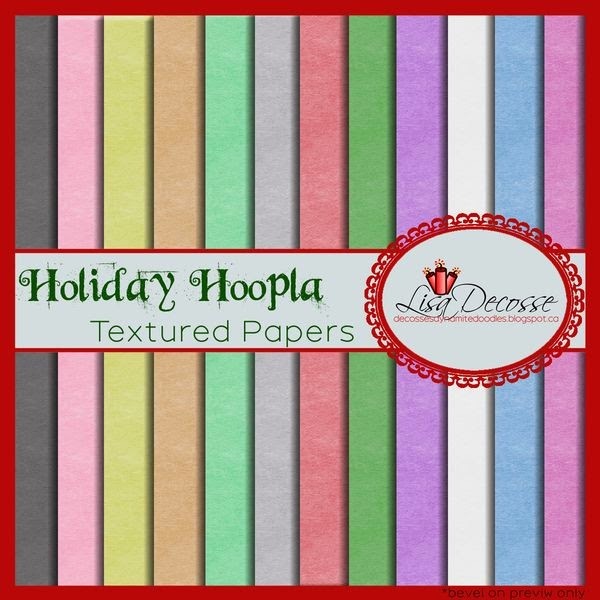 My card is featured as part of the design team on Lisa DeCosse's blog. You can find the post here, along with the winners of the November challenge. The stamped image and sentiment are from Unity Stamp Company. 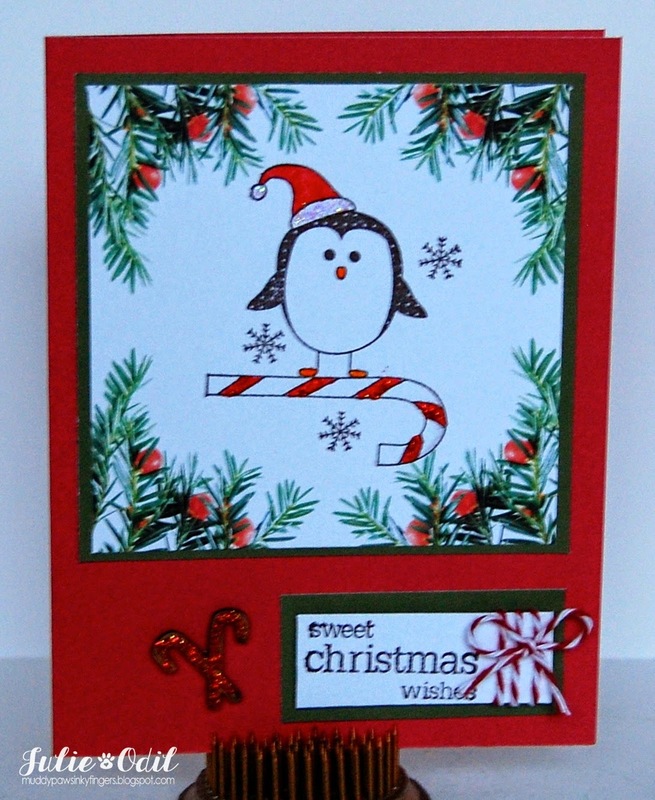 I colored the penguin and candy cane with distress markers, then added some glitter glue. 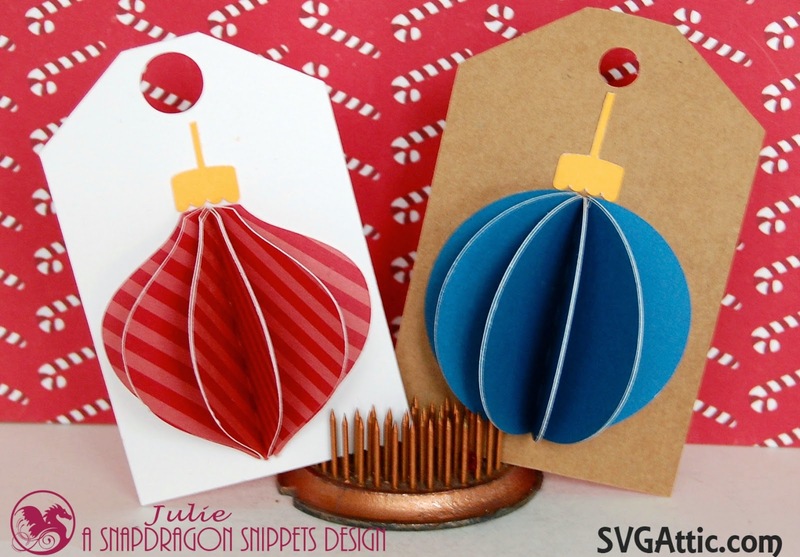 The chipboard candy cane, covered in red glitter glue, is from UmWow Studio. I added some Timeless Twine in Cherry Red to finish the card. 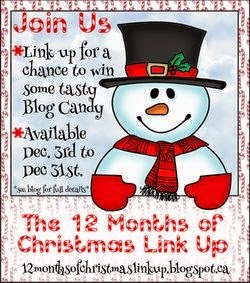 There's still blog candy to win on the 12 Months of Christmas blog, too. You can find the details HERE. Join us, starting Jan 1, for a chance to get a jump start on your Christmas cards while winning some awesome Christmas papers at the same time! It's time for a new project for The Cutting Cafe. This time, the assignment is to use the very handy Gift Bow Template and Cutting File. I realized I wasn't a master at bows (never have been), so I needed to spice it up a bit with the rest of my creation. So, I went to work! This project also uses the Little Red Wagon Cutting File. 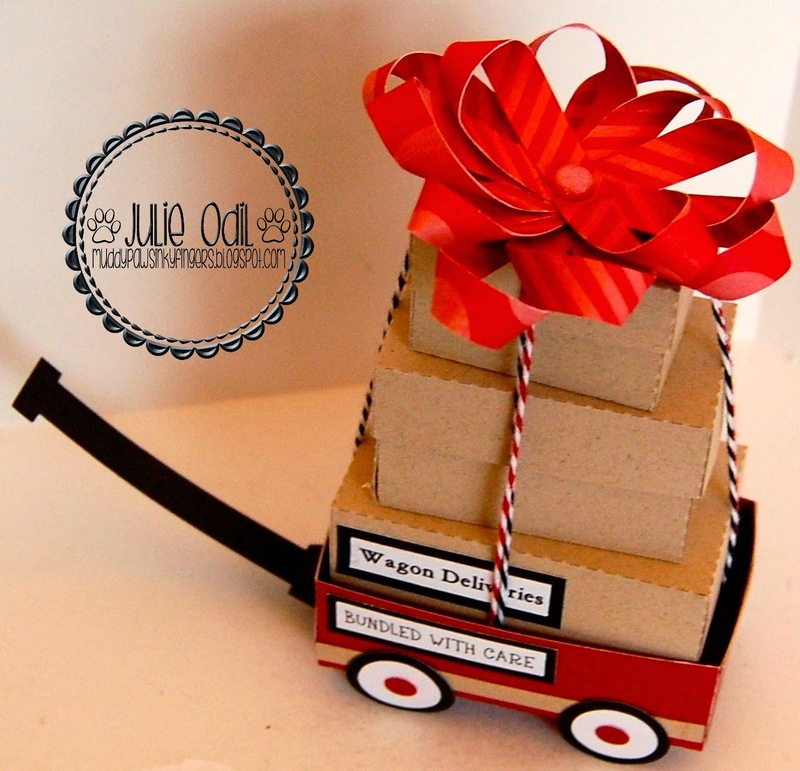 The file comes with the wagon, the boxes in 3 different sizes, and the printable sentiments. I held my Gift Bow together with a brad from Close To My Heart. I liked the way it looked, so I left it showing. The papers on my bow are Echo Park Dots and Stripes. 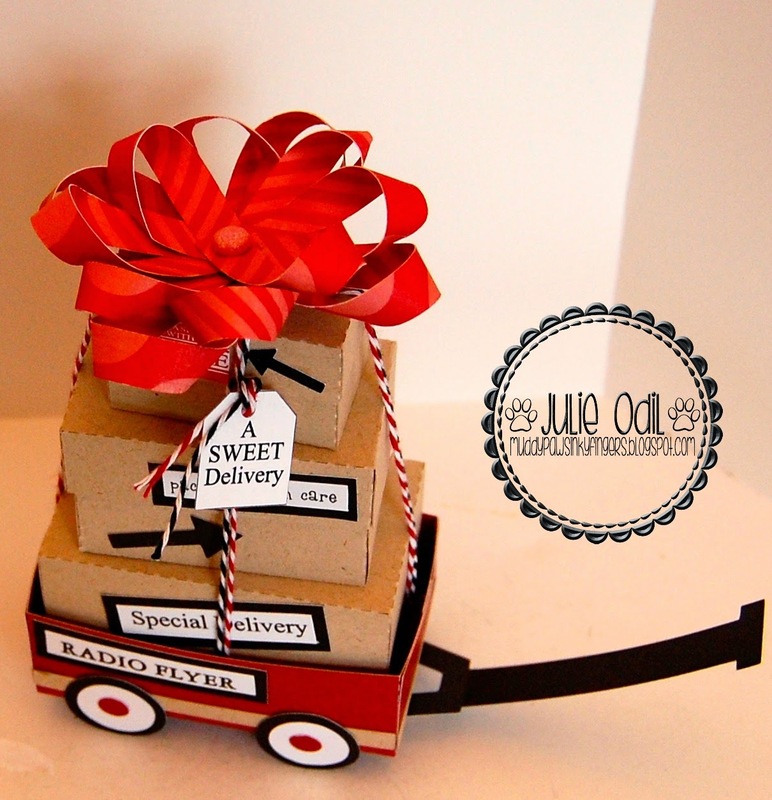 Here's another view of my Gift Bow and Little Red Wagon. There's also some Timeless Twine on my Little Red Wagon. I used Cherry Red and Tuxedo Black. I think these little boxes will be perfect for Christmas. That Little Red Wagon is quite nostalgic, don't you think? 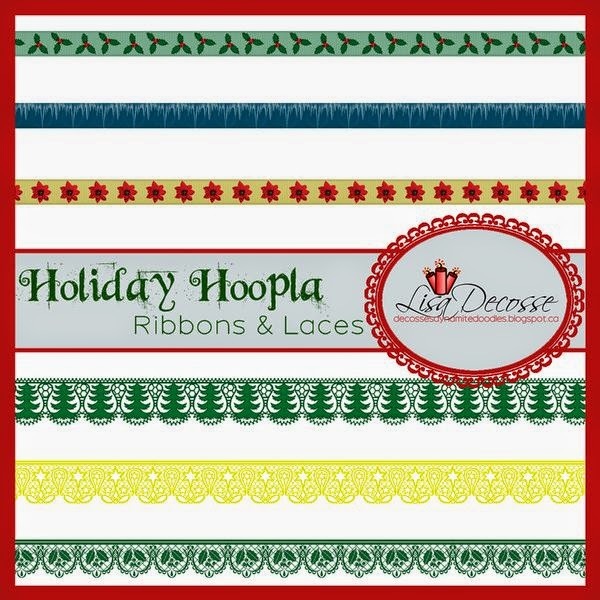 On or after December 21, visit The Cutting Cafe blog to see the other projects created by the design team with this Gift Bow template (theirs actually turned out, I'm guessing!). Leave a comment for a chance to win 3 sets of your choice from The Cutting Cafe Store! Merry Christmas! It's Friday, and time for a new challenge at QKR Stampede. Our theme this week is "Lots of Layers". Well, I figured a snowman would need lots of layers to stay warm! This digi, from QKR Stampede, is called, appropriately, Snowman (digi24233). I colored him with Copic markers, then put several layers of paper behind him, cutting them with a Spellbinders die in 2 different sizes. Then I layered him on a gift bag. Today is the day when I have the party I need the 6 gift bags for. This is #6. Phew! Made it! The ribbons on this bag are from 3 Girl JAM. Join us this week at QKR Stampede for our "Layer it Up" challenge. I'd love to see what you make! It's Thursday, and time for another challenge at Delightful Challenges. Our theme this week is "Celebration". This week, however, is a bit different for us as it is the last challenge for Delightful Challenges. The challenge blog is closing. 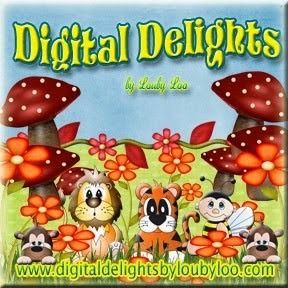 Digital Delights by Louby Loo will remain open and going strong, though! I thought Chubbly Santa would be a perfect way to celebrate my final challenge with Delightful Challenges. Chubbly Santa is available in uncolored and colored versions. I used the uncolored version, and colored him with Copic markers. The sentiment is from the Christmas Hugs Sentiment Set. 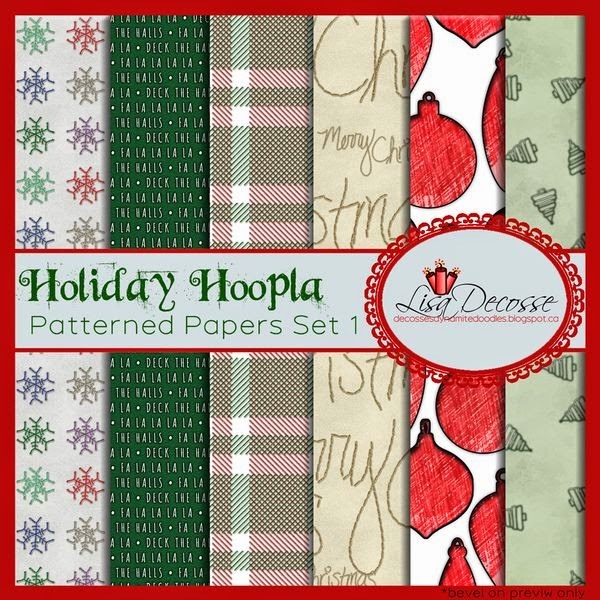 The designer papers are Echo Park 12x12 Reflections Christmas papers. The corrugated silver paper is from American Crafts. I used Cheery Lynn Snow Flower dies for the snowflakes. There's some Cherry Red Timeless Twine wrapped around the sentiment. Lifestyle Crafts circle dies helped with the circle card shape and other circles that I cut. Come celebrate with us at Delightful Challenges -- Christmas, birthday, baby, New year's -- any celebration will do. It's Wednesday, and time for a new challenge at Inspiration Destination Challenge Blog (IDCB). Again this week, our theme is "anything goes", so jump on in and join us! 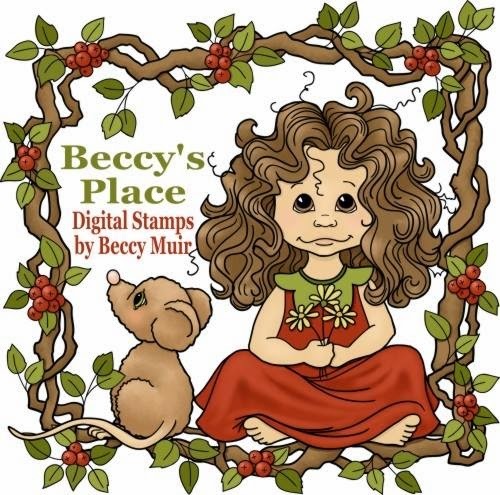 I was lucky enough to be able to use an image by Beccy Muir of Beccy's Place. I used the Poinsettia Swag image and colored it with Copic markers. It was so much fun to shade this one! 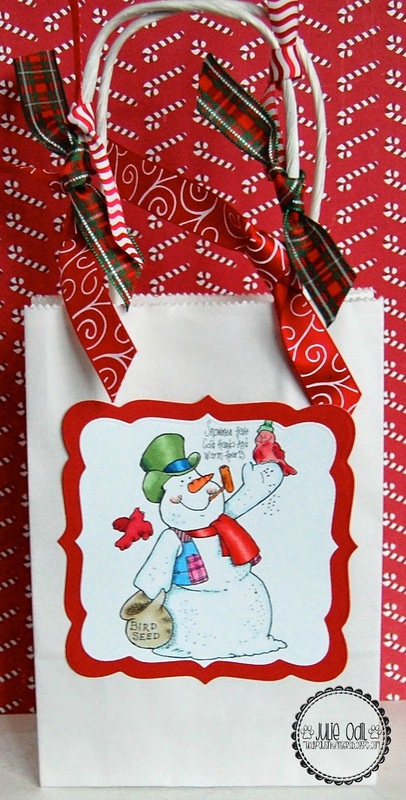 After I got done with my coloring, I used a Spellbinders label die in 2 different sizes to mount my image to my gift bag. I then tied some ribbons from Really Reasonable Ribbon to the handles of the bag. A big thanks to Beccy's Place for sponsoring this week's challenge! Come join us a IDCB -- remember, anything goes! Shine Bright! for Amy Doodle's Stamp Co. 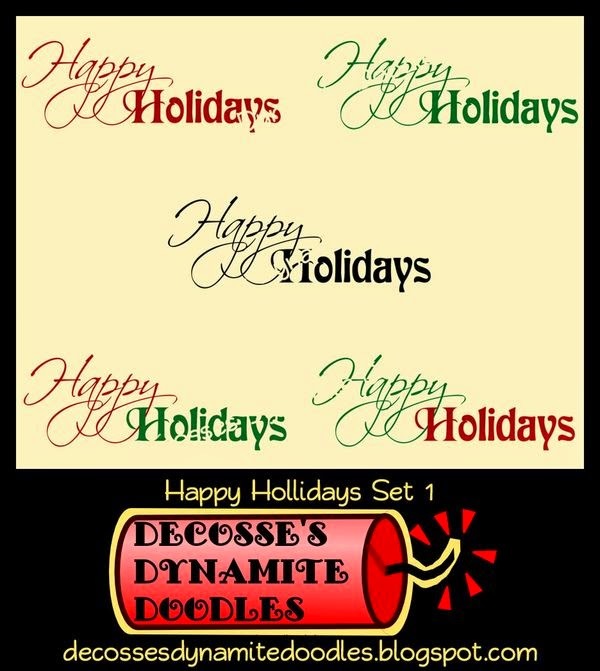 The digi set comes with the image and some sentiments, all from Amy Doodle's Stamp Company. I colored the image with Copic markers, then cut it out with a Spellbinders die. While still in the die, I inked the edges with a couple shades of Tim Holtz distress ink. I used another Spellbinder die for the glitter paper, and mounted the image with 3D foam tape to the glitter paper (by American Crafts). 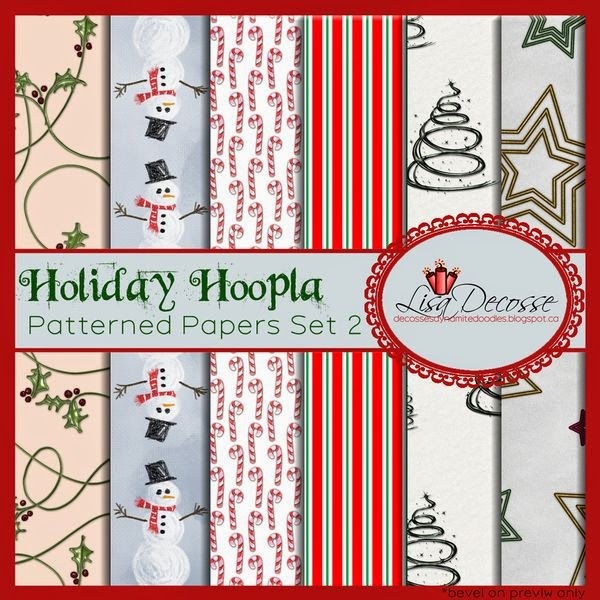 The designer paper is "The 12 Days of Christmas" 6x6 pad from My Mind's Eye. 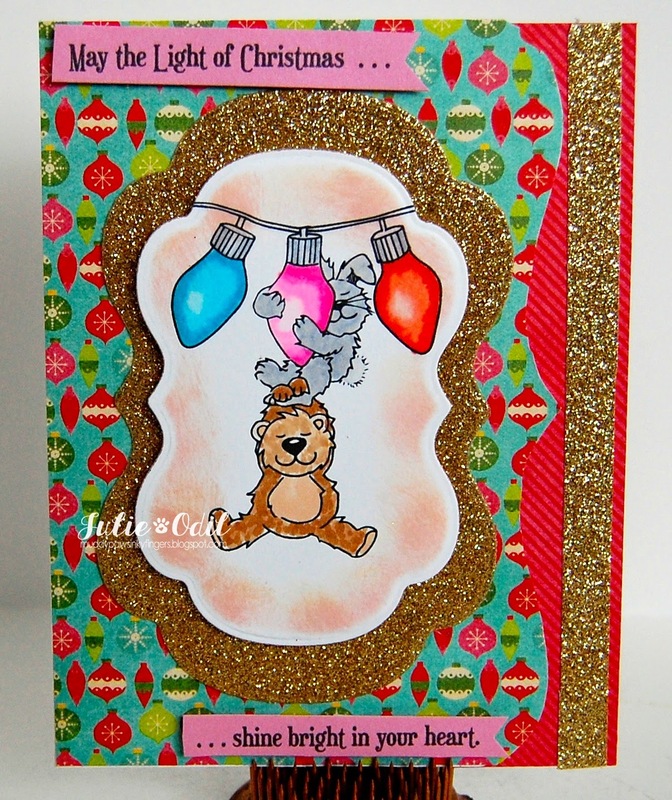 The gold glitter trim is from Close To My Heart, as is the die cut card base. May the light of Christmas shine bright in your heart! It's Monday, and time for a new challenge at Eureka Stamps. Our theme this week is "For the Birds". My husband and I have fed birds since we were married, so this "Feeding the Birds" digi (digi10501) from QKR Stampede (our sister company) instantly appealed to me. I colored the image with Copic markers, then used several Spellbinders dies to cut it out. 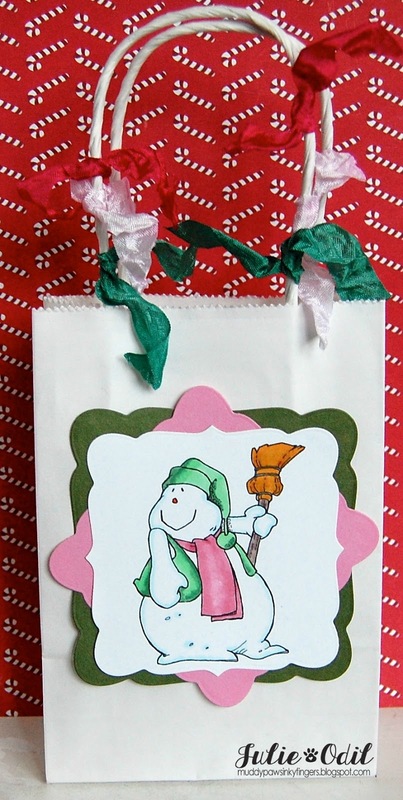 If you are a regular blog follower, you know I'm on a quest to get 6 gift bags made. Here's another! The sentiment is is also from QKR Stampede (digi13804). The ribbons on the handle of the bag are from Really Reasonable Ribbon. Join us this week at Eureka Stamps for our "For the Birds" challenge. I'd love to see what you make! It's Friday! Whoop! And time for a new challenge at QKR Stampede. 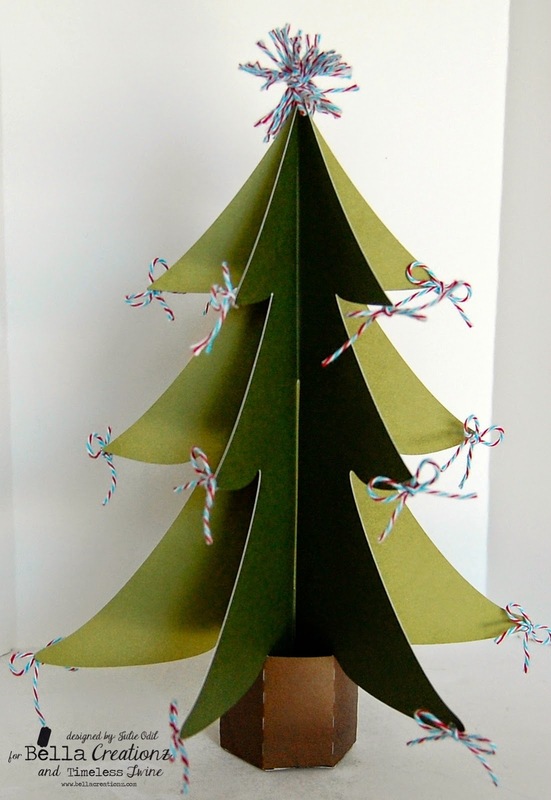 This week, our theme is "Trim the Tree". 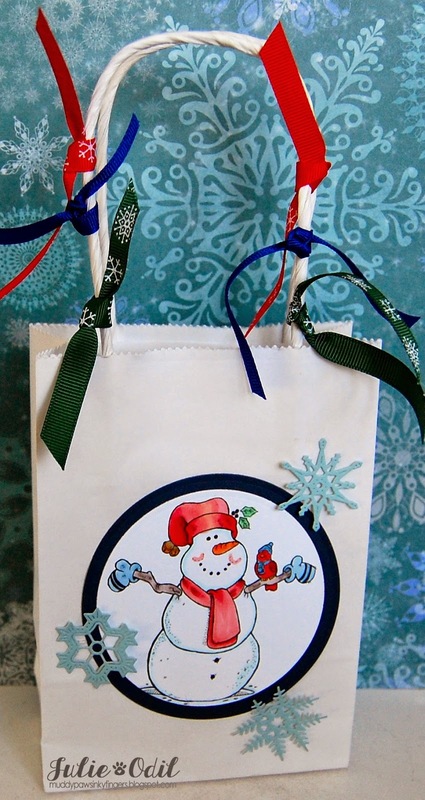 In my quest to get a bunch of gift bags made for various Christmas gatherings, I chose to make a bag for under the tree. This delightful QKR Stampede digi is called "Winter Friends" (digi13004). I colored these 2 chums with Copic markers, then used Lifestyle Crafts circle dies to mount the stamped image on the gift bag. 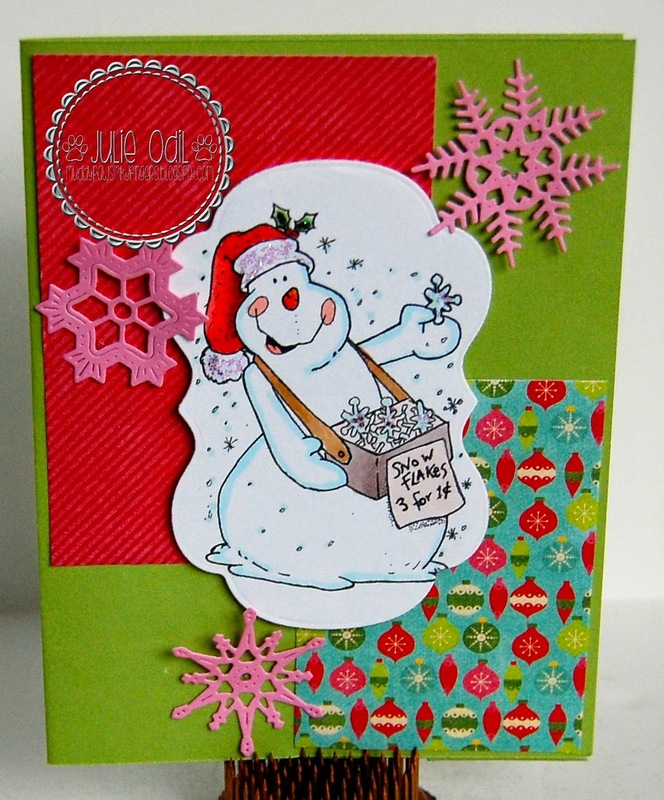 The snowflakes were cut out with a Cheery Lynn Snow Flower die. The ribbons are from Really Reasonable Ribbon. Join us this week at QKR Stampede for our "Trim the Tree" challenge. It'll be great fun! It's Friday! And I'm posting today for 3 Girl JAM, and linking this up with Unity's Friends With Flair. There's 3 Girl JAM Jute Ribbon, 3 Girl JAM Christmas Candy ribbon from the Seasons Bundle (my all-time favorite), and a Love Flair Button on this card. The stamp, from Unity Stamp Co., of course, is a Stamp of the Week. I stamped the image, colored it with Copic markers, and fussy cut it. The sentiment is part of the the stamp set. I use a Spellbinders die to cut it out. The circle was sprayed with various alcohol inks using an airbrush. All papers are by Close To My Heart. Need some Flair, Jute, or crinkle ribbon for yourself? Or for a Christmas gift? Use discount code JO10 for 10% off of anything in the 3 Girl JAM Store. 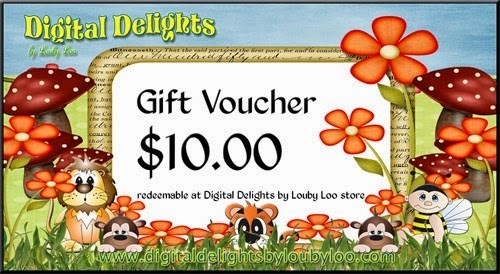 You can find the image in the Digital Delights by Louby Loo Store. 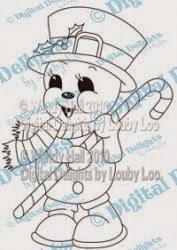 Candy Cane Jingles comes in uncolored and colored versions. I colored Candy Cane Jingles with Copic markers, then used a Lawn Fawn stitched die to cut him out and mount it with 3D foam tape. 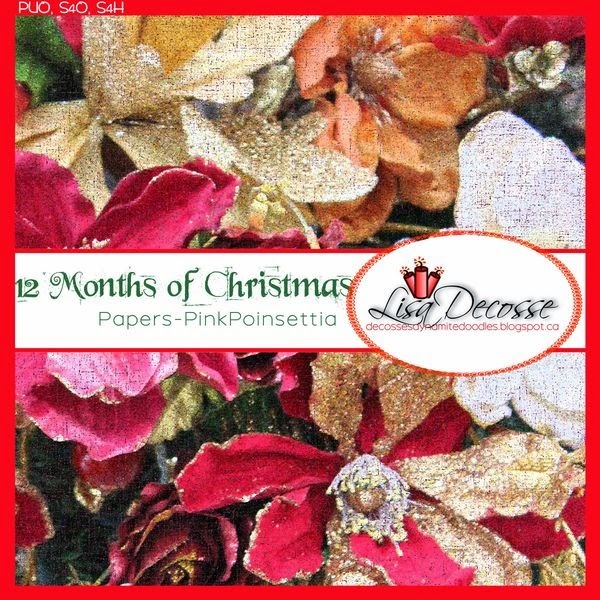 The designer papers are Pink Paislee Snow Village 6x6. The card base is Juniper card stock from Close To My Heart. The crinkle ribbon is from 3 Girl JAM. These are the two colors in the Winter Bundle. Come join us at Delightful Challenges for our Bundle Up Challenges. Stay indoors, stay warm, start crafting, then come link up! I'd love to see what you make! We are a few days into December and the holidays are in full swing. Before we know it, Christmas day will be upon us. 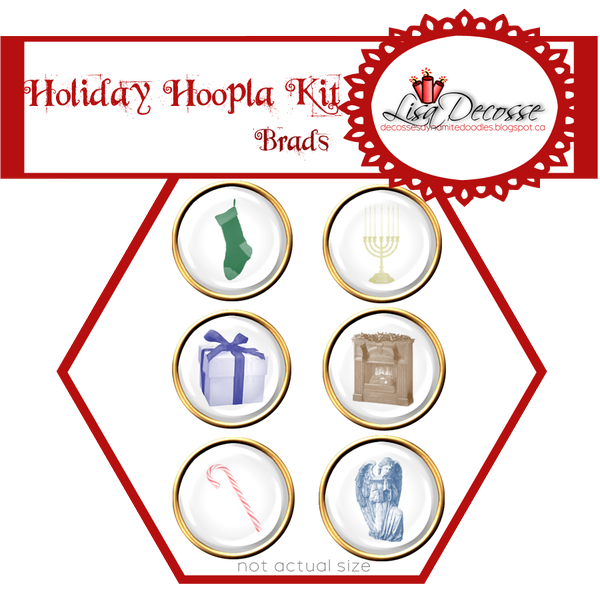 Lisa and Monica, owners of the 12 Months of Christmas Link Up, wanted to help spread some holiday cheer by offering up some blog candy. Here are all the digital goodies up for grabs. That is a total of seven prizes up for grabs! Now, to qualify for the blog candy, we ask if you are not already a follower, that you do become one through Google Friends Connect (your little picture shows me you have linked up.) Also, we would love it if you put our badge on your sidebar, label it Blog Candy and link back here to this post so more people can join in on the fun. So, head on over to the 12 Months of Christmas Link Up, follow these steps, and I'll cross my fingers for you! Good luck! Get Ready for Gift Bags! Beary Christmas! for Amy Doodle's Stamp Co.